This entry was posted in Zinc Blog on May 15, 2013 by Zinc & Co. The weekend before the one just gone, yours truly was lucky enough to attend one of the most enjoyable and lovely weddings I’ve been to for a very long time, one of my BFFs, beautiful Nikki. This entry was posted in Zinc Blog on April 15, 2013 by Zinc & Co.
Bring Spring into your home with these beautiful bird-themed homewares accessories and art! 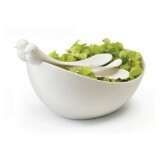 The charming sparrow server handles slot perfectly onto the rim of the salad bowl, and instantly add a dash of quirky springtime fun to your kitchen and dining table. This entry was posted in Zinc Blog on March 19, 2013 by Zinc & Co.